Calling all cheese lovers, I've got pretty exciting news for you! 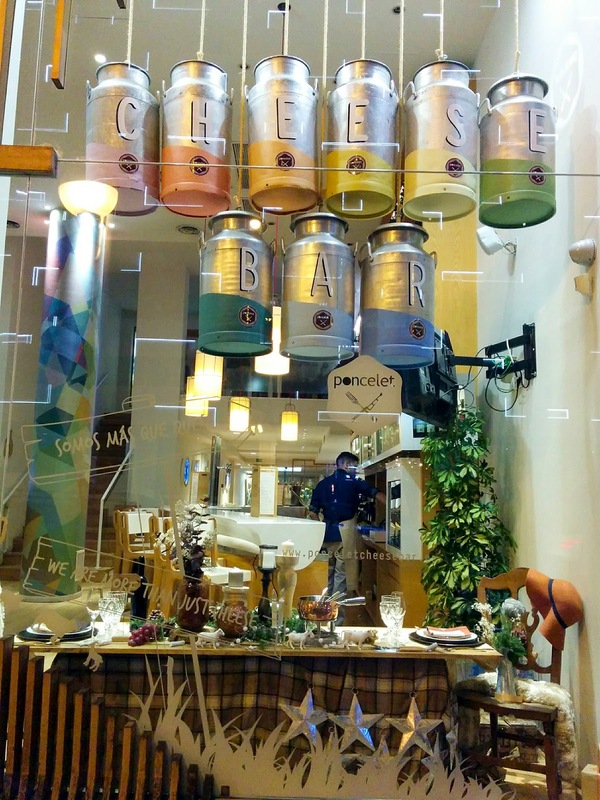 I've found a restaurant in Madrid that is cheese lovers' paradise. The restaurant is huge and has different areas including a counter to grab a quick bite, semi-private areas, and long tables for big groups. White and nordic designs predominate. Very original decor that mirrors the different steps of cheese making welcomes you, like a vertical garden representing the meadows or a ceiling with lights that look like udders. Most tables are big to fit in fondues, raclettes and cheese platters and the chairs are really comfy. The friendly staff will explain the menu and all the options available. 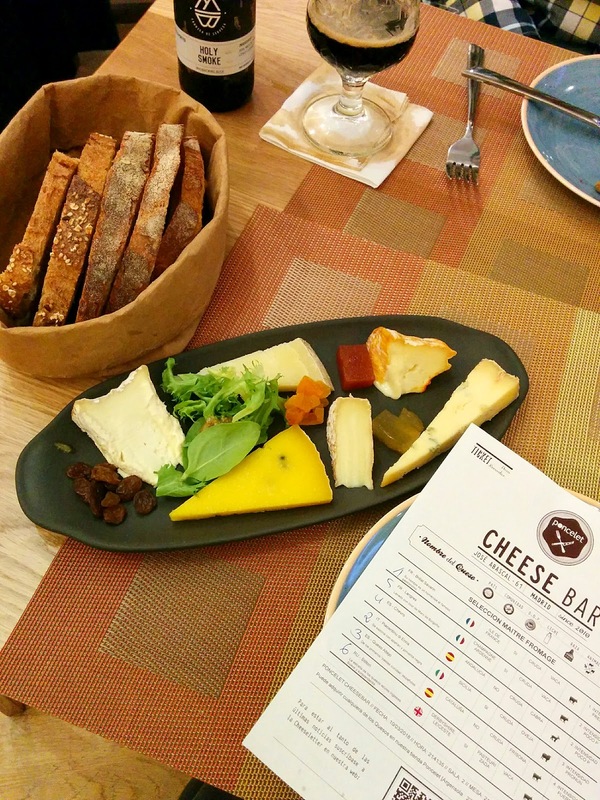 They have a menu with pages and pages of different cheese from all around the world so you can make your own customized cheese platter. A fondue or a raclette is an excelent choice if you are with a group of friends. And don't worry if you or one of your companions is lactose intolerant or vegan, Poncelet offers dairy-free versions of most dishes. Since it was just me and my hubby, we ordered a small cheese platter and two main dishes which were served with different types of delicious bread. A kind waiter brought a paper with the main characteristics of each cheese and explained the order in which we had to eat them. Next, we had a sald and cod. When I saw the waiter approaching with a cocktail shaker I almost told him that he was at the wrong table but turns out that my salad was in it. He shook it and poured it on my plate. It's actually a genuis idea to dress a salad perfectly! The desserts are delicious and are made by my favorite macaron shop in Madrid: Moulin Chocolat. We ordered the New York cheesecake and the giant chocolate macaron. 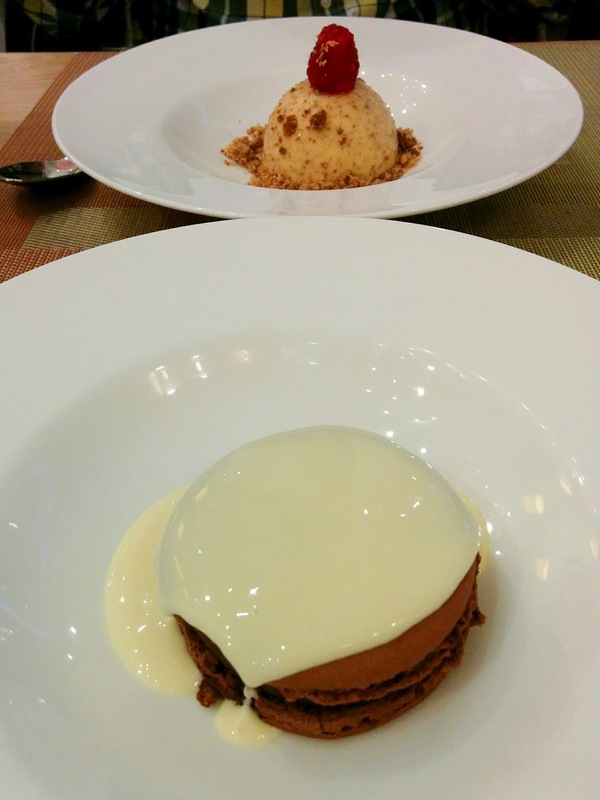 We loved Poncelet Cheese Bar and we will surely visit them again. How about you? Are you interested in having a very cheesy experience? Seems delicious! I like the way it is presented! Oh how cool - I bet this was lots of fun! What a lovely place! Thanks for sharing all the pictures. I'm your neighbor at #TrekkingThru. Thanks for stopping by Gayl! I love all the bright colors here! What a cheery cheesy restaurant! I wish we would have stopped by when we were in Madrid last year! This is my kind of place! I love Madrid and its gastronomic offering. I am taking notes since I am dying to go back (hopefully soon). This place looks so good. I love cheese. It doesn't always sit well but it doesn't stop me! I love this post as I love cheese. I need to visit when I go back to Spain. Yes!! Cheese everything! And love that garden wall, so pretty. Ooo I love the sound of this!! I'm a cheese lover AND always wanted to try vegan cheese as well! Now you got me all hungry...haha. Looks like fun place, I love cheese. YUM! Enjoy your day! What a fun and unique place! The food looks amazing, my mouth is watering just looking at it. I love cheese! I am a sucker for a good cheese board or charcuterie plate. When I was in France and Amsterdam we hit all the cheese shops! This is such an adorable place! So cozy, homey, and really inviting. Food looks delish too. Will definitely put this on my bucket list! Thanks for sharing dear. This looks like such a cute little place! All of that cheese is making me so hungry. This is making me miss Madrid! Such a nice place. Oh my gosh... YUM! We're going to Spain for our honeymoon next year, so I'll definitely save this place on my to-do list! This looks so good! I've started eating cheese again, and I LOVE it! I've said it for a long time now but I've got to visit Madrid. Especially now that I wat animal foods again so I can have all your yummy foods! All of that cheese looks so good. I want to visit that place now! On my list for when I travel here! Thanks for taking part in the Travel Tuesday meme. OMG I'm a foodie so this post was perfect for me. Not only is Madrid on my travel bucket list, now I know where to grab good eats! Thank you for taking out the time to leave a comment!